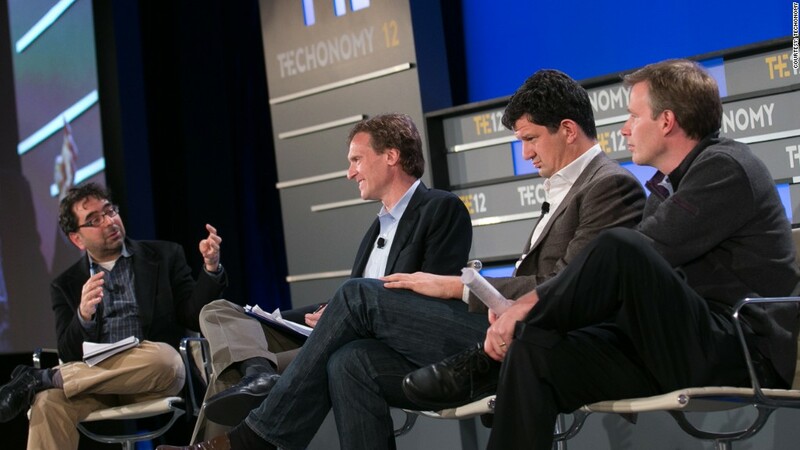 Moderator Eric Savitz (left) oversaw a Techonomy panel with Internet analysts Alec Ellison, Steve Hasker and Mark Mahaney. There are four tech companies controlling the industry's direction: Apple, Google, Amazon and Facebook. Will they still be ruling the tech field in a decade? "At least three have established very deep moats," meaning that it's almost impossible for newer rivals to overtake them, Internet analyst Mark Mahaney (formerly of Citigroup) said Sunday during a panel discussion at the Techonomy conference in Tucson, Ariz. "Probably Apple, too." Google (GOOG) and Facebook (FB) have the richest data sets on their users, but Amazon's data graph is probably the most valuable, Mahaney believes, because it tracks where customers are actually spending their money. Apple (AAPL) -- the company with the highest market capitalization in the world -- has the hardest position to defend, several of the panelists said. It can't maintain its stratospheric growth without constantly pulling new rabbits out of its hat, and rivals like Samsung are chipping away at its market. "Apple to me is the most vulnerable," said Alec Ellison, the head of investment bank Jefferies' technology practice. "It has to maintain this innovation edge." Streaming video is shaping up to be one of the fiercest battlegrounds. Apple's long-rumored iTV could be its next game-changing breakthrough, but the cable companies are pushing back hard -- and Amazon (AMZN) and Google are also in the hunt. Live sports and premium scripted programs are the video Holy Grail, according to Nielsen executive Steve Hasker. Whoever gets access to them gains a huge strategic advantage. Which brings us to the industry's dark horse: Microsoft (MSFT). Microsoft has been left out of discussions of the Internet's Big Four because it dominates in the enterprise, not the home. Consumers don't have the same deep engagement with Microsoft's products as they do with their Facebook page or their iPhone. But Microsoft is finally, belatedly, trying to claw its way in. It cannonballed into the gadget market with Surface, and it's using Windows 8 as a "one platform" link to tighten the ties between products in its vast lineup. Microsoft is quietly striking content deals that morph Xbox from a video-game console into a home entertainment hub -- one that could go head-to-head with Apple. "We share Microsoft's excitement about Xbox," Nielsen's Hasker said. "Can they segue to own the consumer across all kinds of different experiences? That to us looks like the most interesting piece of real estate they have in the home." Microsoft has another advantage: It's no longer in the U.S. government's crosshairs. Microsoft's consent degree -- the set of restrictions that emerged from its bruising late-'90s antitrust battle -- expired last year. Google has taken Microsoft's place as the antitrust lightning rod. The Department of Justice is preparing what looks like a sweeping case against the company, which could end up curbing some of Google's expansion plans. Apple, too, has faced some antitrust rumblings, while Facebook risks getting smacked down for its caviler privacy practices. Even with those threats, Techonomy's panelists agreed that it's hard to see any of the current big four losing its leadership spot. But they also acknowledged that predicting the future of tech is a fool's game. A decade ago, Mark Zuckerberg hadn't yet dreamed up a little venture called Facebook.